Presented by Titan Pharmaceuticals at the 87th annual conference of the American Thyroid Association in Victoria, British Columbia, Canada, October 2017. Presented at the Asia Pacific Military Health Exchange (APMHE), Singapore, May 2017. 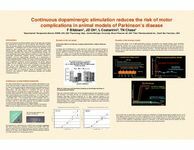 Presented by Titan Pharmaceuticals at the Movement Disorder Society (MDS) 19th International Congress of Parkinson's Disease and Movement Disorders, San Diego, California, June 2015. Presented at the American Association for the Treatment of Opioid Dependence conference in Philadelphia, Pennsylvania, November 2013. Results of a Six-Month, Randomized, Controlled, Phase-3 Trial Comparing the Efficacy and Safety of Buprenorphine Implants to Placebo Implants, and Sublingual Buprenorphine/Naloxone for Opioid Addiction. 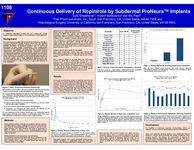 Presented at the American Society of Addiction Medicine (ASAM), Atlanta, Georgia, April 2012. Presented by Titan Pharmaceuticals at the 13th annual meeting of International Society of Addiction Medicine (ISAM), Oslo, Norway, September 2011. Presented by Titan Pharmaceuticals at American College of Neuropsychopharmacology (ACNP), Hollywood, Florida, December 2009. Presented by Titan Pharmaceuticals at the Society for Neuroscience, New Orleans, Louisiana, November 2003.